Choosing the perfect blinds for your conservatory is really easy with our dedicated in-home service. 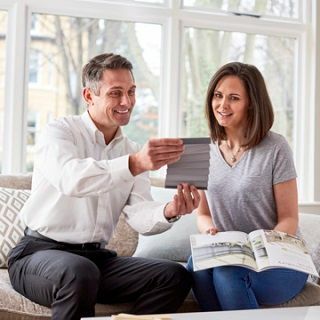 Request an appointment and one of our specialist advisors will visit your home to show you our range and advise you on the best options for your particular needs and personal taste. Your advisor will also tell you about the innovative fabric options that are available to help you control light and temperature – an important consideration for any room with a large area of glass. Depending on the number and type of conservatory blinds you require, we may also carry out a technical survey to finalise the exact fitting position of your blinds. This is particularly important if you’re choosing roof blinds for irregular shaped windows. Then we’ll agree a fitting date when we’ll return with your beautiful made-to-measure conservatory blinds. On arrival we’ll protect your floor with dustsheets before professionally fitting your blinds. And when we’ve finished, we’ll tidy up, leaving your conservatory clean and dust free. Before leaving, your advisor will show you how to operate your blinds. If you’ve chosen motorised controls, you’ll be shown how to use the remote control system too. Our conservatory blinds specialist will visit your home at a time to suit you. Browse our wide range of conservatory blinds at home and benefit from a specialist’s advice. Your new conservatory blinds will be professionally fitted and look fantastic. Considering conservatory blinds for your home? 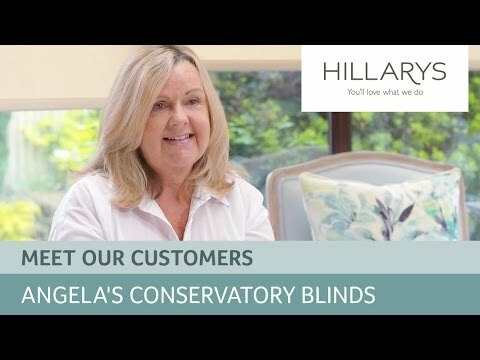 Take a look at our short video following customer Angela, as she showcases her stylish and practical conservatory side and roof blinds. Angela tells us why they’ve improved her conservatory and how she now can’t wait to spend time in her south facing conservatory.